Here's another central agency change as SuperYachtsMonaco say they've taken over the central listing for sale of the 42m motor yacht Oxyzen. A semi-custom yacht from AB Yachts’ 140 series, built in 2007, Oxyzen has futuristic exterior styling that will turn heads in every port and guests will be whisked away at an impressive cruising speed of 35 knots. Her minimalist interior has guest accommodation for 10 in a master suite, two VIP staterooms and two twin cabins. 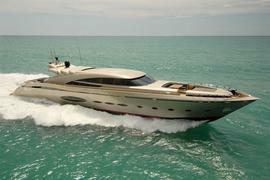 Her top speed is 40 knots, courtesy of triple 2,400hp MTU engines. On view at the Monaco Yacht Show, Oxyzen is asking €6.9 million.